An expert hair cut is the most important part of styling a short hair. Once the hair cut is done then with the magic of today's styling products and tools, you can change your look on a whim. You can go to work in the morning with poker straight hair and go out that evening in tight, glossy curls. Or yesterday's sleek bob can be transformed into today's messy bedhead look. What do you have on your bathroom shelf? How to style short hair with basic hair styling products like Hairspray, mousse, volumizer, styling gel, paste, putty, pomade, finishing gloss, frizz and curl control products? Relax, you don't need all of them. You just need the ones that can make the most of your hair type and deliver the styles you want. When you have short hair, life becomes a lot simpler, less blow drying, no more headaches just pure bliss and for some cuts it is completely effortless to maintain. Synthetic material create static or electric charges on the hair and make the hair "flyaway". A good brush will allow you to place the hair where you want it. You can choose your hair brushes base on personal choices like weight, length, design and comfort. For short thick, coarse hair use a short natural bristle and for soft thin or fine hair a longer bristle is more suitable for your hair. 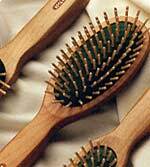 Brushes with longer bristle gently stimulate your scalp and distributes natural oil. We are delighted to introduce this Holistic and natural wood bristle hair brush that removing toxins while restoring natural body to hair. Add your hair styling fun to our site. Upload photo(s) of your best hair style and tell us how you style your short hair. How do you style your short hair?